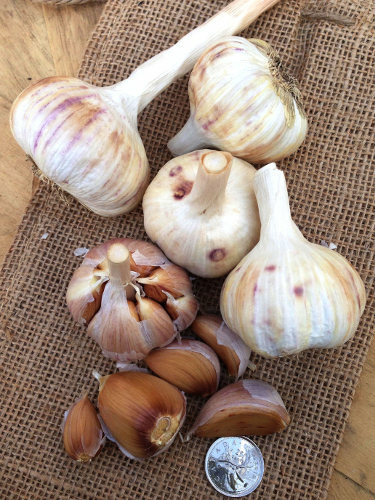 The dark red skin of the cloves of this beautiful rocambole garlic is quite striking. And the flavour is incredible: rich, hot and strong. Unlike many hardneck garlics, the flowering stem, or scape, does not get stiff and can be braided without much difficulty. The large bulbs 6-7cm across, typically have 8-9 cloves. This is a good mid-season variety that will tolerate wetter, more northern conditions.